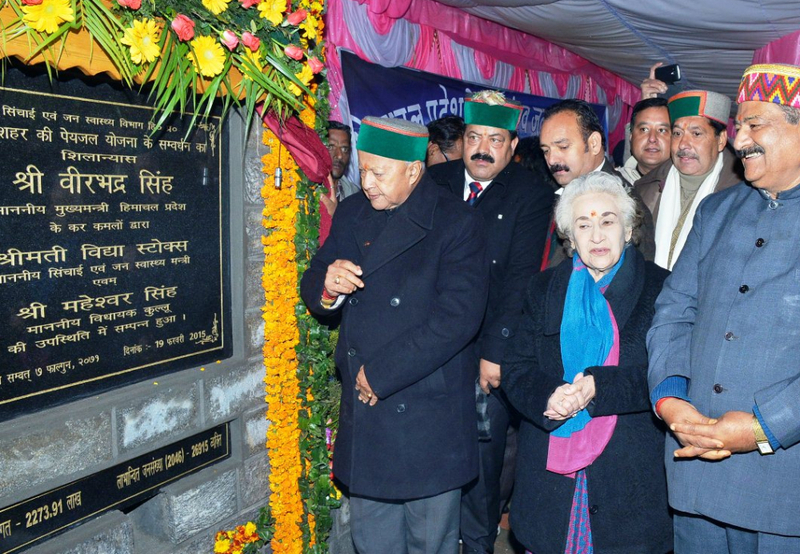 Chief Minister Virbhadra Singh laid foundation stone of automated Kullu drinking water supply scheme for Kullu town. The scheme will cost Rs 23 crore and will benefit the local population of Kullu town and would also cater to the drinking water needs of as many as 72000 persons including floating population of Kullu town till 2046. The Chief Minister also laid foundation stone of the automated Manali drinking water supply scheme to cost Rs 15.04 crore. The water will be lifted from Manalsu Nallah and scheme is expected to benefit as many as 32000 people of Manali and its suburbs besides catering to the needs of the people till 2046. The Chief Minister also laid foundation stone of renovation and improvement of Manu Rangshala to cost rupees 90 lakh and also laid foundation stone of jeepable Bridge at Kalath to be completed at cost of 1.43 crore which will benefit residents of Jagatsukh and Gojra Panchayats besides those residing on the left bank of river Beas. He also performed foundation stone of Nature Park at Bandrol. Irrigation and Public Health Minister Vidya Stokes was also present at the occasion.